Image credit Otto Yamamoto via Flickr. It had only been four months since Nelson Mandela’s release from prison. 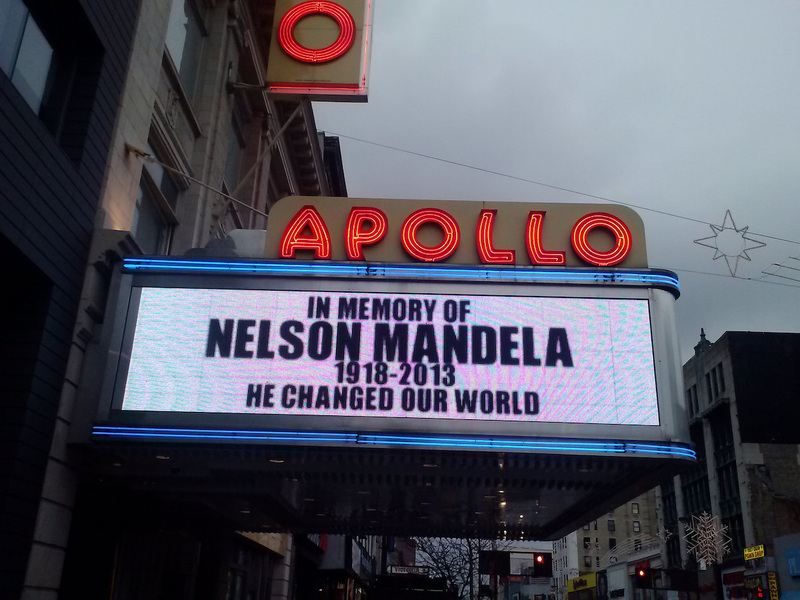 Harlem was a stop on the Mandela’s international political tour that continued through the end of the year. The tens of thousands of African Americans at the Mandelas’ rallies in Harlem, the Bronx, Bedford Stuyvesant, Los Angeles and Miami reflected African Americans’ deep political investment in South Africa. I was a 16-year-old eager consumer of African history and politics waiting on the south side of 125th Street, across from the Victoria Theater. I was squeezed among the tens of thousands staring expectantly at the large stage erected at Africa Square for the Mandelas, in the shadow of the Hotel Theresa. The sun was going down when the icons of African liberation arrived and approached the front of the stage, clenched right fists raised. The first couple of African nationalism stood smiling before the throng of adoring African Americans. We cheered with pride as Winnie hugged pan-Africanist and Harlem activist Queen Mother Moore, who was on stage with business leader Percy Sutton, pan-Africanist activist Elombe Brath, rapper Flavor Flav of Public Enemy, and a few others who I either did not recognize or do not recall. I had no doubt that this special moment was part of an African political renaissance that would buttress Third World solidarity in the US. “There is an umbilical cord that ties us together,” Mr. Mandela told us. Then added, ”My only regret is that I am unable to embrace each and every one of you.” He said that Harlem, whose events he had followed for 30 years, “signifies the glory of resistance.” The rapture in the crowd after seeing Mandela and hearing his voice was immense. Meanwhile Ms. Mandela greeted us with “Amandla!” Elated and full of love, we thundered back, “Awethu!” Harlem, she said, is “the Soweto of America” and she called for an immediate end to Apartheid. 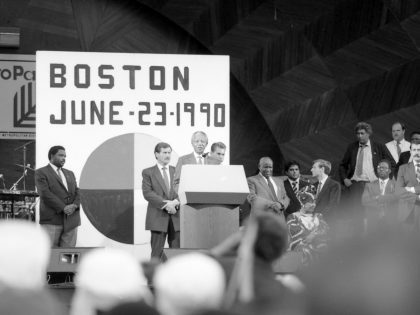 What I did not know at the time was that thirty years earlier, at that same intersection, Third World solidarity in the US had its symbolic beginning. In 1960, Fidel Castro stayed with his entourage at the Hotel Theresa, while in New York to address the UN General Assembly. During his brief stay, Castro refashioned Harlem into the center of Third World and anticolonial solidarity, in the heart of New York, the center of First World capitalism. He invited African American leaders to the hotel to meet with him, including Malcolm X and Langston Hughes. In a dramatic play on Cold War tensions, Soviet Premier Nikita Khrushchev, President Gamal Abdel Nasser of Egypt and Prime Minister Jawaharlal Nehru of India also each traveled to Harlem to greet the Cuban leader. Framed in the context of Castro’s time in Harlem, and the subsequent defining events of Third World solidarity, anti-racism, and anticolonialism, the Mandelas’ Harlem rally had added meaning. At 16, I was not aware of this historical nuance. I regarded Mandela’s freedom and the couple’s presence in Harlem as significant steps toward our pan-Africanist triumph over global white supremacy. I could not have known that rather than inaugurate a new age, the Mandelas’ appearance marked an ironic end to that era. The Mandelas’ visit and the winds of change blowing through South Africa capped 30 years of unprecedented African American involvement in African affairs and culture, which reached its high point during the 1980s. In politics, at no point before or since then have African American elected officials—not to be confused with leaders who are African American—exercised sway of such depth and unified magnitude, or demonstrated such outpouring of interest and solidarity with African affairs. During the late 1970s increasing numbers of radical African American leaders transitioned from activism to electoral politics and brought a sense of pan-Africanism and Third World solidarity with them into the halls of power. A large enough segment of the African American community was invested in African issues for African American lawmakers to embrace African affairs within their political agendas. Apartheid in South Africa allowed lawmakers and activists in the 1970s and 1980s to seize the moral high ground and compel Congress, universities, and corporate boards to accept positions of the Third World left and pan-Africanists on US policies that were central to altering US relations with white-minority regimes in Rhodesia and South Africa. Jesse Jackson’s presidential campaigns, the Congressional Black Caucus, Free South Africa Movement, and TransAfrica, in addition to countless local and grassroots organizations, raised the legitimacy of African affairs in US politics and political discourse, during the 1980s. Harlem during the 1980s enlivened my sense of connection to Africa. The African street vendors on 125th Street created a market-like atmosphere. I had the luxury of lazy afternoons spent in politically oriented bookshops like Liberation Bookstore on the corner of 131st Street and Lenox Avenue, and the crowded kiosks of MART 1.2.5, where my friends and I purchased chew sticks, Muslim oils and incense, and procured recordings of lectures by Dr. John Henrik Clark, Joseph Ben-Jochannan, and Malcolm X. Africa, it seemed to me, was not distant, but, rather, everywhere. In those days, popular hip-hop also carried African-centered themes and aesthetics. Groups from the X-Clan, to the Brand Nubians, Queen Latifah, the Jungle Brothers, and KRS-1, while not lacking in misogyny, imbued Afrocentricity with hipness and relevancy. Fittingly, in 1986, Stetsasonic released “A.F.R.I.C.A (Free South Africa! ).” Local music video programs in New York featured the group’s video regularly throughout the remainder of the decade. I saw it as natural that during their US tour the Mandelas highlighted many of these connections. The appearances at the Hotel Theresa of Castro in 1960 and the Mandelas at Harlem’s Africa Square in 1990 bookend a period of Third World solidarity and pan-Africanism in African American politics and popular culture. Nelson Mandela’s freedom and the Mandelas’ international tour did not end Apartheid but left no doubt that its end was imminent. Resistance to white-minority rule in Africa, and anti-colonialism generally, had been the tie that bound African American engagement with African affairs. The end of abject white supremacy in Africa was the African American consensus on Africa. Multiracial elections in South Africa in 1994 did not completely end African American engagement with Africa. But in subsequent years, Africa’s presence in African American politics and popular culture rapidly decreased. Why did the CIA want to silence Mandela? And what does this tell us about his political legacy? 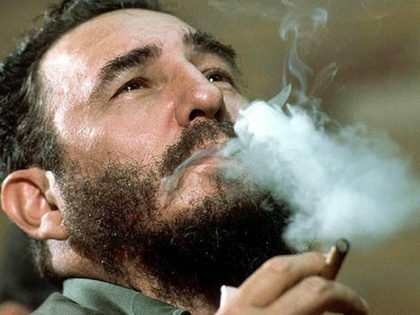 On 25 November 2016, Fidel Castro passed away. To many Africans Fidel was a hero, playing a central role in their liberation from colonialism. If you became politically aware in the late 1970s, you became aware of a world in which no greater sustained evil existed than apartheid. There were other horrors, of course, but apartheid was insidious, entrenched, and total. It built a model of permanent exploitation and enforced it with violence. It classified human beings and forbade them from loving and living beside one another. Its apparatus of segregation, Bantustans, prisons, and immiseration abused dignity with systematic perversity. Its helmsmen spread violence across South Africa’s borders and spat in the face of a disapproving world.